California State University, Northridge’s associate professor of sociology Moshoula Capous-Deyllas and co-researcher and activist Milia Akkouris, launch the Queer Lens in Focus photo-voice exhibit, which features more than 250 photographs taken by 14 displaced refugees and asylum seekers living in Athens, Greece, that identify as LGBTQ+, on Saturday, March 23. The exhibit will illuminate identity, express hope for a better life, identify needed resources, and grapple with physical, emotional and symbolic notions of home through photography. Their images document their migration to Greece, the loved ones they left behind, and the new communities they formed along the way, as they affirm their identities build solidarity and celebrate their survival. 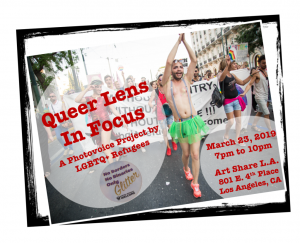 “This project highlights the social, political and economic challenges of displaced LGBTQ+ people from Syria, Iraq, Uganda, Cameroon, Pakistan and Cuba,” said Capous-Deyllas. “All of the participants have faced oppression in their respective countries of origin due to their sexual orientation or gender identity,” she said. 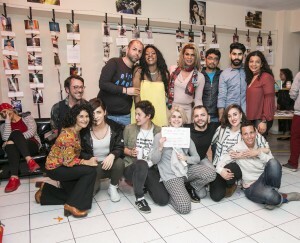 In close collaboration with the LGBTQ+ Refugees Welcome Collective, Capous-Deyllas and Akkouris were able to establish relationships in Athens with refugees and asylum seekers to work together on creating this project. Through photo-voice methodology, they placed the power to create art and represent knowledge in the hands of the participants themselves. As an arts-based researcher for more than 12 years, Capous-Deyllas focuses her work on social justice issues, taking the data she’s collected beyond the scope of the academic community to facilitate social awareness and policy change. The exhibit will be held at the Art Share Gallery in downtown Los Angeles at 801 E 4thPlace from 7 p.m. -10 p.m. for one night only. Admission will be free and open to the public, light snacks and refreshments will also be provided. The photo-voice exhibit also will be on display on the second floor of CSUN’s Manzanita Hall during the months of April and May.